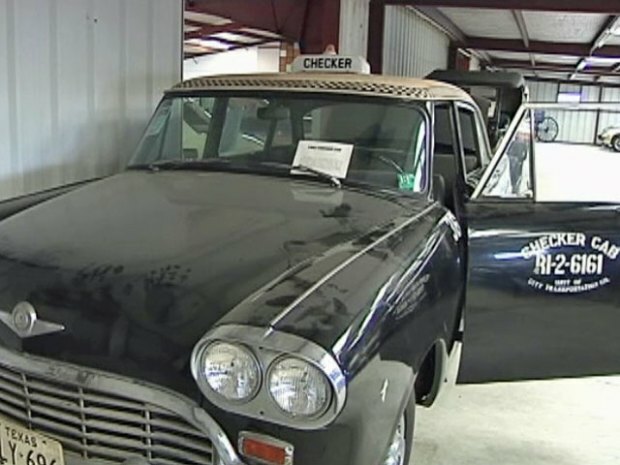 The Checker cab once known as Lee Harvey Oswald's getaway car sold for $35,750 at auction on Saturday. Cab 36 was sold along with the rest of the collection from the defunct Pate Museum of Transportation in Cresson, about 17 miles southwest of Fort Worth. RM Auctions car specialist Donnie Gould said the cab is "a big piece of history" and prior to auction expected it to fetch around $30,000. That's far more than the nickel Oswald paid for his 95-cent cab fare on Nov. 22, 1963. Oswald hailed the cab after the bus he tried to escape in got stuck in traffic moments after President John F. Kennedy was fatally shot. Oswald is accused of assassinating Kennedy, having fired the fatal shot from the sixth floor window of the old Texas School Book Depository in Dallas. More than 40 vehicles from the defunct Pate Museum of Transportation in Cresson go up for auction Saturday. The cab is now headed to the Historic Auto Attractions museum in Rockford, Illinois, where it will join a large collection of other Kennedy memorabilia. RM Auctions and the Pate Family said Saturday's auction exceeded their pre-sale estimates, and that there was a high volume of telephone bidders from across the country and as far away as the United Kingdom and Switzerland. Total sales at the auction exceeded $1.9 million.